Is Déjà Vu A Symptom of Temporal Lobe Epilepsy? See also the Déjà Vu Questionnaire and The Psychology of Déjà Vu. This study shows there are at least four specific subtypes of déjà vu corresponding to diagnostic categories and that such phenomenological experiences may be used in diagnosis and management (N=89 ) **. 89 subjects were grouped into 2 categories (normals with and without subjective paranormal experiences) and a neuropsychiatric group (with schizophrenics and temporal lobe epileptics and other epileptics) to test the hypothesis that there are several distinct clinical pictures of déjà vu that are homogenous for diagnostic or nosological subtype. A déjà vu questionnaire consisting of screening and qualitative questions as well as a less structured chosen-case description was used as a measuring instrument to retrospectively evaluate Ss' déjà vu experiences. Four distinct clinically homogeneous categories of the déjà vu experience emerged using multidimensional scaling and in fact they were distributed in four different quadrants in the median column geometry analysis. In the Normals: Subjective paranormal déjà vu experience was characterized by its time distortions and specific predictions component occurred in the subjective paranormal experiment. In the average person, normals without claimed psychic experience, the experience of déjà vu had a lack of memorable/outstanding features, just a perplexity and is generally infrequent and short lasting - so called, Associative Déjà Vu. In the neuropsychiatric group, déjà vu experienced by temporal lobe epileptics was characterized by ictal and postepileptic features, such as stereotypical other temporal lobe features with headache, clouded consciousness and sleepiness afterwards. This type of experience did not occur in schizophrenics, whose déjà vu experiences were characterized by psychotic intrusions. The data support the empirical validation of the Neppe Déjà Vu Questionnaire, the first of its kind. Qualitative déjà vu screening instrument for psychosis, seizures and subjective anomalous experience has possible valuable applications. This framework has enormous potential phenomenologic application to the detail needed in analyzing other neuropsychiatric experience. Neppe's empirically tested operational definition for déjà vu is any subjectively inappropriate impression of familiarity of the present experience with an undefined past. A theoretical motivation for this definition involves reasons for the rejection of other terms, and déjà vu is differentiated from flashbacks, pseudopresentiment, actualized precognition, and cryptomnesia. There are 21 kinds of déjà vu, including 10 new terms introduced by the author. There is also a metaphorical journalistic use of the term. There are 7 major phenomenological classifications of the déjà vu experience: a disorder of memory, a disorder of ego state, an ego defense, a temporal perceptual disturbance, a recognition disorder, a manifestation of epileptic firing, or a subjective paranormal experience. The incidence of the déjà vu experience is dependent on the operational definitions of déjà vu, the measuring instrument, and the recall and recognition of the déjà vu experience by the subject. 16 studies of déjà vu existed by the early 1980s, but the only one using adequate sampling were the 2 studies by Neppe which also used an adequate screening questionnaire for déjà vu. A more adequate study of incidence should use a large, randomized sample for the general population in a prospective study of incidence and frequency in the individual. Overall, about 70% of the population seem to report déjà vu. The youngest age of déjà vu reported is age 5. (two cases in Neppe's samples; one aged 6 reported by Ouspensky). This has major theoretical implications for cognitive development. There is a complex interchange with age and incidence based on quality of remembering. There was at one point the idea that there was an inverse relationship with age in adulthood but this is disputed in one study by Neppe in the elderly. There is no single theoretical cause of déjà vu that can explain its wide variety of clinical manifestations. Most instances of associative déjà vu are associated with a predisposing milieu of anxiety and are triggered by restricted paramnesia and redintegration. The Psychoanalytic and psychodynamic theories are also common explanations. However, temporal lobe firing and the double access theories account for many of the experimental and clinical features of the déjà vu experience of temporal lobe epileptics. Also, several parapsychological hypotheses have been advanced. Déjà vu in schizophrenics reflects a further nosological category, again implying different etiologies, precipitators, and pathogeneses. The definition and conceptualization of the déjà phenomenon are interpreted in various ways in medicine. The common occurrence of déjà is the general population stresses the need for the development of specific qualitative features for valuable diagnosis of temporal lobe epilepsy. Qualitatively this exists. Please note these references are provided as a service; they cannot be sent to you. Neppe VM: Is déjà vu a symptom of temporal lobe epilepsy? S Afr Med J 1981; 60 (23): 907-8. Neppe VM: A study of déjà vu experience: thesis. Johannesburg, University of the Witwatersrand, 1981:1-1-588, Vol 1-4. 3. Neppe VM: A study of déjà vu experience. 1982. Neppe VM: déjà vu and temporal lobe epilepsy. London, 1982:1-36. Neppe VM: The Psychology of déjà vu: Have I been Here Before? : 1-277 & I-XLV. Johannesburg, Witwatersrand University Press, 1983. Neppe VM: The different presentations of the déjà vu phenomenon: New research. 1983:1-124-139. Neppe VM: The incidence of déjà vu. Parapsychological Journal of South Africa 1983; 4 (2): 94-106. Neppe VM: The concept of déjà vu. Parapsychological Journal of South Africa 1983; 4 (1): 1-10. Neppe VM: The causes of déjà vu. Parapsychological Journal of South Africa 1983; 4 (1): 25-35. Neppe VM: Genes, genetics and heritability: Beyond semantics. 1983:1-84-85. 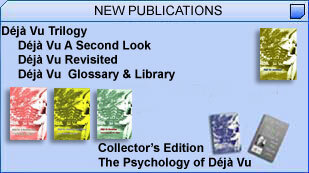 Neppe VM: déjà vu: A parapsychological approach, in Roll WG, Beloff, J, White, RA (eds.) Research in Parapsychology 1982 Metuchen, NJ., Scarecrow Press, 1983, pp 226-228. Neppe VM: Age and the frequency of déjà vu. 1983:1-182-184. Neppe VM: Temporal lobe, psi and déjà vu. 1985:1-330. Neppe VM: déjà vu in the survival context. Theta 1986; 13/14 (2): 26-29. Neppe VM: déjà vu: phenomenological and diagnostic relevance in temporal lobe epilepsy. 1986:1-608. Neppe VM: déjà vu:1. What is it? ASPR Newsl 1987; 13 (1): 6-7. Neppe VM: déjà vu: 2. When and how? ASPR Newsl 1987; 13 (2): 15-16. Neppe VM: déjà vu: 3. Why? ASPR Newsl 1987; 13 (3): 24-25. Neppe VM: déjà vu: 4. The differences. ASPR Newsl 1987; 13 (4): 31-32.